We are volunteer-run and need people to help staff pet food banks, fundraise, represent us at events, pick up pet food from pet food store donors, host fundraising and outreach events, grow our partnerships, and more. 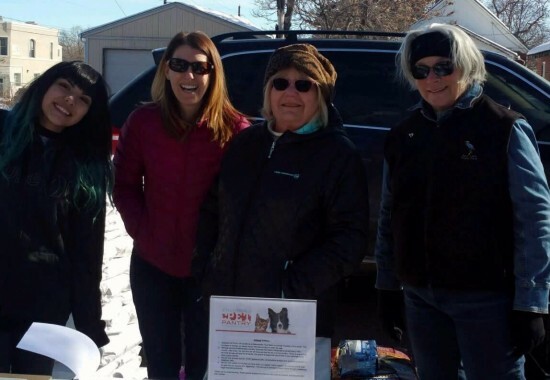 Lead Pet Food Bank Volunteers: Run a pet food bank location (monthly). Requires 7 hours per month and large vehicle (SUV or truck). More info here. Donation Pickup Volunteers: Weekly communication with partner stores in your neighborhood or on your daily path to work, and transport from partner stores to our warehouse. Please fill out form below with your interest. Food Bank “Lead Volunteer” – Run a pet food bank location (monthly). Requires 7 hours per month and large vehicle (SUV or truck). More info here. Event Planning – Help us plan fun events! Please fill out form below with your interest. Warehouse Sorters– Help us sort donations at the warehouse in Englewood. Lifting up to 30 lbs. is typical, but we can work within many physical needs. 2-20 hours a month (completely flexible around your time availability). Warehouse Pet Food Bank “Pallet Builders” – Help put together the pet food that will go to a pet food bank, working from a packing list. This is done at the warehouse in Englewood. Lifting up to 30 lbs. is required. 3 hours a month (this role can be accomplished on your schedule, as long as you can come in once a month). Regional Manager – As we expand to places like Colorado Springs, Grand Junction, and Cortez, we’re looking for regional managers to help us set up new pet food banks, arrange logistics, partner with area pet food businesses, recruit volunteers, etc. This is a new role, and likely 15-20 hours a month. Please fill out form below with your interest. Pet Food Pickup – Weekly communication with partner stores in your neighborhood or on your daily path to work, and transport from partner stores to our warehouse. About 2-6 hours a month. Please fill out form below with your interest. Volunteer Manager – Manage, train, support, and celebrate volunteers, as well as solve volunteer shortages (often the day or day before a pet food bank, so this requires some weekday flexibility). Please fill out form below with your interest. Marketing – Marketing and writing background required. Please fill out form below with your interest. Commit to about seven hours per month, typically during weekdays. We request that you commit to being the lead volunteer for 80% of the next year’s pet food banks at a location. We say “80%” to allow for vacations, sick days, etc. Meet insurance requirements. For everyone’s safety and protection, our insurance requires that you have a minimum $100,000/$300,000 Bodily Injury Liability and $50,000 Property Damage Liability. Allow us to perform a background check. We are required to run a background check on all “drivers” which is a primary function for Lead Volunteers. We’ll train you to run the pet food bank and you’ll always have support. If you’re interested in learning more about becoming a lead volunteer for a pet food bank, please fill out form below.